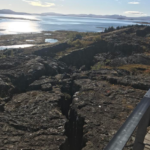 We arrived in beautiful Iceland after a short 2 hour WOW air flight from Dublin on a Friday afternoon, grabbed our bags and quickly headed towards the meeting point to meet the rep from the car rental company. Having carried out a lot of research we choose Lagoon Car Rental for our trip. 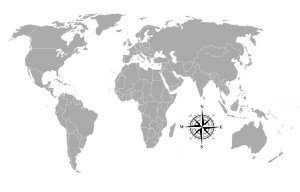 Lagoon are a family owned business with offices at both Keflavik airport and Reykjavik. Some of the key factors which influenced our decision to go with Lagoon were firstly; their cars are all less than two years old, there was a huge selection of options and additional extras. While getting value for money is important one thing I will never scrimp on is car safety. That is even more important in a country where we are driving on a different side than we are accustomed allied to the fact the weather conditions in Iceland have the potential to be unpredictable. 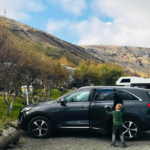 We met the Lagoon Car Rentals in the arrivals hall of Keflavik airport and took the short trip in their mini bus to their desk just outside of the airport grounds. 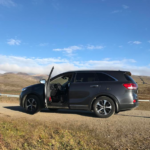 We were lucky it was nice and quiet at the time being later in the afternoon so the entire process was quick and seamless and we were sitting in out Kia Sorrento in a very short space of time. The kids loved the hot chocolate in the waiting area! We went for a 4*4 automatic and added on the 2 car seats and gps. The vehicle itself was immaculate inside. 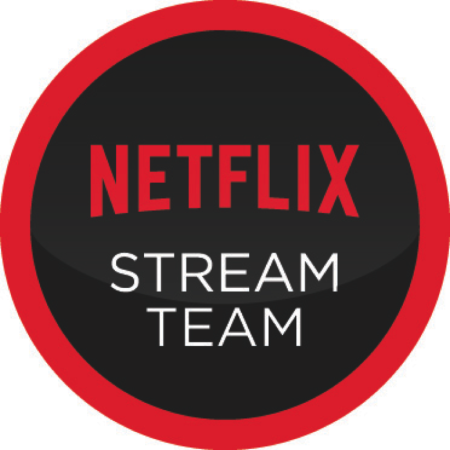 We took our time going through the condition before signing off to take it away. This is something I would strongly urge anybody to do. I took a lot of pictures too in case of any disputes, of which thankfully there were none! And with that we hit the road for our hotel in Reykjavik. 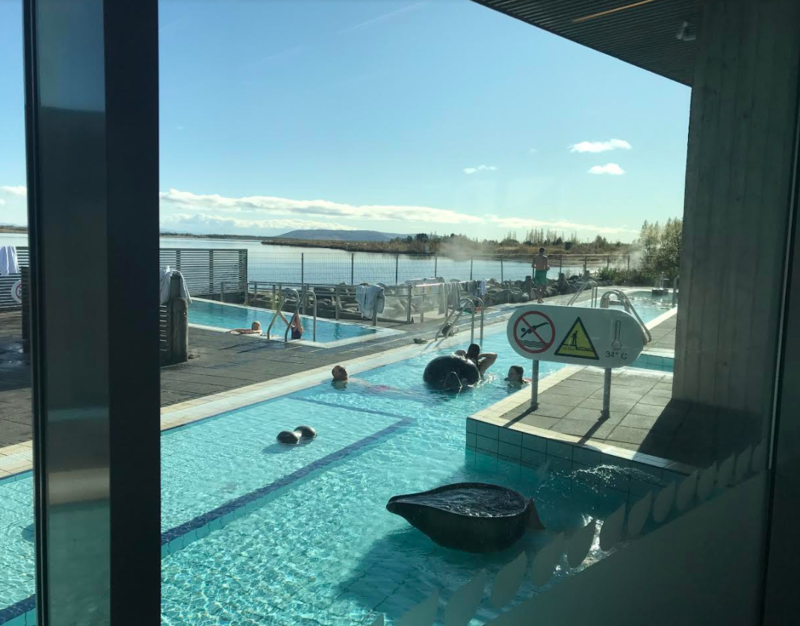 We spent the first night relaxing at the hotel and get to bed early so that we could depart early for our Golden Circle tour. I had read loads and done a lot of research so I had it more or less planned out so that we could make the most of it. We were truly blessed with the weather. While it was cold it was bright and crisp without a drop or rain or snow in sight! There is a saying in Iceland that if you don’t like the weather wait 5 minutes. 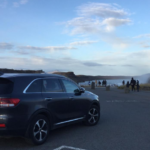 Iceland is prone to huge variations in the weather conditions even within the one day so my advice is to have the car well equipped. We had changes of clothes, food, rain gear and walking gear. Just in case! But that is the luxury of having a car you can just dump all in the boot!. We departed Reykjavik bright and early. The sky was so clear and so blue, we were so excited. Stop one was Thingvellier National Park which is a UNESCO listed site which once housed the Icelandic Parliament. 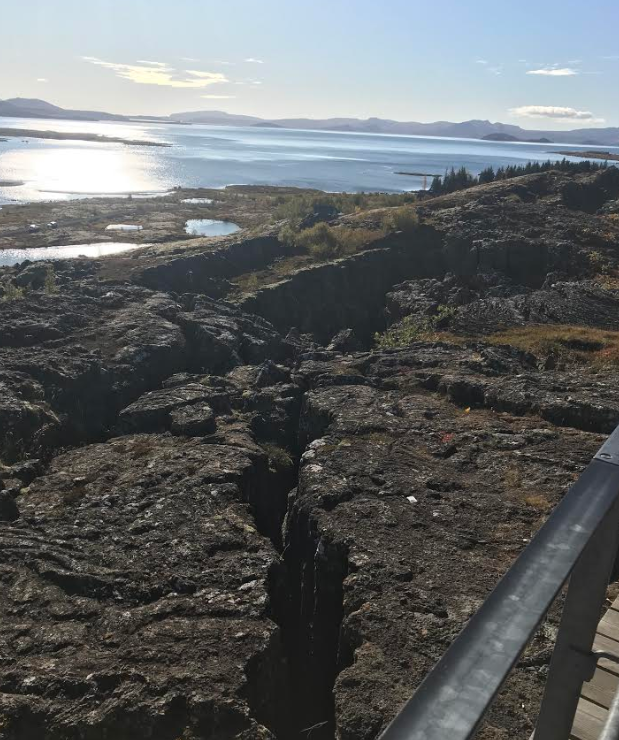 The kids were particularly excited to see the rift in the landscape cased by the separation of the 2 tectonic plates. Its quite remarkable to think where you are standing and what is going on in the ground beneath you! We parked up and walked one of the trails, which is a little uneven so do bring good walking shoes. It wouldn’t be buggy or wheelchair friendly the particular section we choose so do plan your route in advance. The entire landscape here is breath taking. I actually don’t thing any photos could even do it justice. No matter which way you look its simply stunning. One thing I did notice was how crisp and fresh the air felt. You could spend hours here, looking at the old stone ruins and walking the trails but we were on a tight enough time scale so departed after maybe 2 hours and a hot cup of coffee! Mamma F Top Tip– Parking needs to be paid for in the visitors centre as apparently they read the registration on the way out. Loads of toilets and coffee shop there so well worth a quick stop. After a quick coffee and rest of the legs we headed back to the car to get to our next stop – Fontana Thermal Spa. Lunch eaten and we headed to the changing room to get ready for our dip in the geo thermal pools. 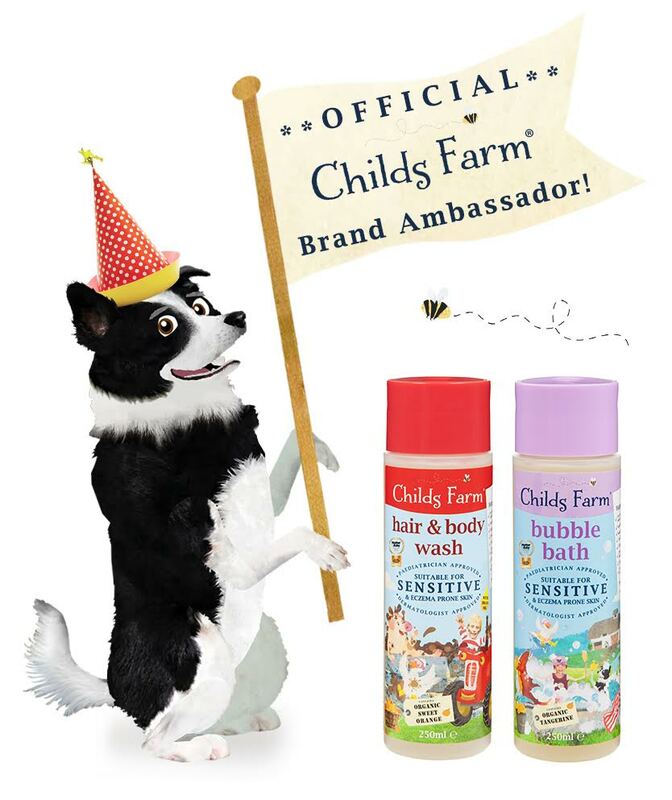 One thing to bear in mind is that you must shower before you go to the pools and not doing so is viewed as being very disrespectful by the locals. The changing rooms have lockers and plenty space to get organised. The layout and setting of the pools is really lovely. There are a number of pools each with different temperatures. Onsite there are also sauna and steam room and for the brave amongst us you can take a dip in the ice cold lake. Its apparently very good for the body and heart to alternate the temperature but im quite happy to take somebody else’s word for this!! Mamma F Top Tip – have lunch at Fontana and follow up with home made ice cream at Efstidalur II, you will not be disappointed. So so so tasty and the setting is lovely looking out over the farm. 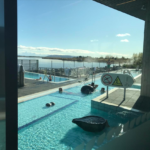 Geysir is located a short and scenic 25 minute dive from Fonanta. I was so curious to see this natural phenomenon with my own eyes. 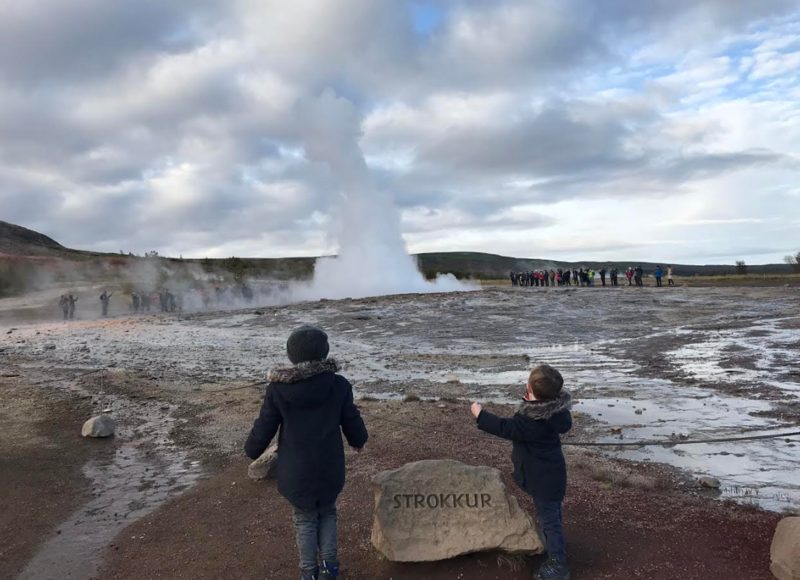 The gesysir itself is named Stokkur and erupts every 6-10 and can reach up to 40 metres in heights. So lots of photos opp if you miss it the first time. The kids roared the first time. Its so impressive and slightly unnerving to thing of all the activity going on under the ground here. There are petrol pumps and a fast food stop here so handy if you do need to refill. On that note on thing we had remarked to date is that the Kia Sorrento is very fuel efficient. We didn’t see many petrol stations along the route so do plan accordingly. 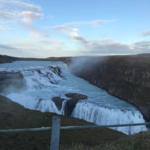 Evening was starting to fall and we headed for the car again for today’s last stop….the epic Gullfoss which is probably the best known and iconic of all the waterfalls in Iceland. Mamma F Top Tip – There are facilities here for petrol, toilet, hot cup of coffee etc. 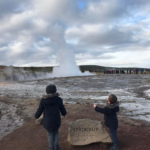 The lovely couple we met at Fontana suggested we should take the first sign post for Gullfoss and park at that level to avoid the 50 or so steps down which was great advice when travelling with young kids. 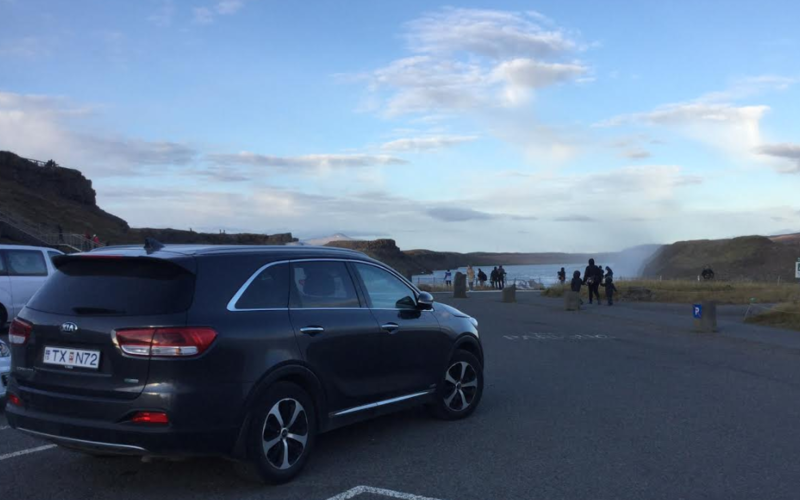 As soon as we opened the doors of the car we were hit with the spray of the mighty Gullfoss. Its breathtaking. I could show you a million photos but no one would really do it justice. On sunny days this is a great site for seeingrainbows. We didn’t see any on our trip but trust me rainbow or not this site is well worth a visit. You hear the roar, you feel the spray. Its windy, its cold, its wet but its so worth it. The falls themselves fall 32 metres in two stages into a canyon where the falls reach 70 metres. Its wasnt overly busy when we were there but it was getting late in the evening. 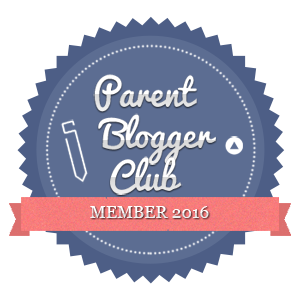 Mamma F Top Tip – Be careful near around the edge, there is a fence but it is windy there and with kids you couldn’t be careful enough. 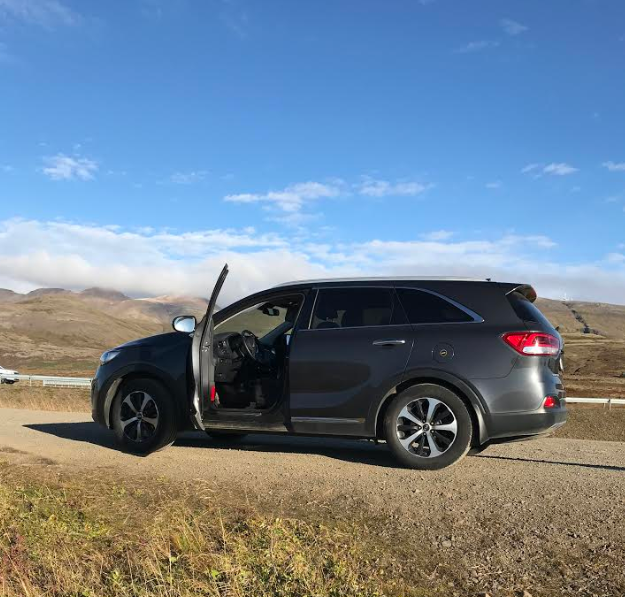 And that was it, we headed back to the Kia (made use of the heated seats) tired and weary but very content as we headed back to our hotel in Reykjavik. In total id say we spent about 10 hours from start to finish. We didn’t rush it, we stopped at some of the viewing point (please please only stop at designated areas) and enjoyed a long and relaxing soak in the thermals pool. By 9 o’clock that night the entire Mamma F crew were fast asleep after our wonderful adventure. 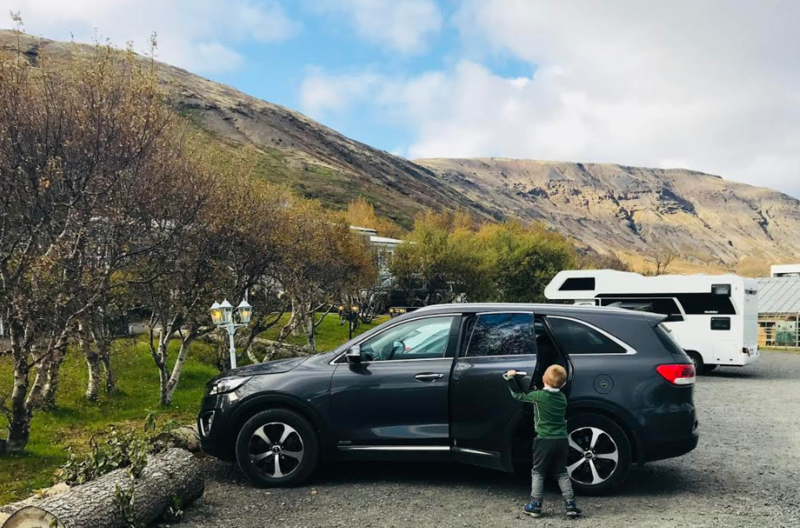 Hiring a car is the only way to really do the Golden Circle with kids. You can take all the bits you need, you can stop when you need and you have utter comfort. They say Iceland steals your heart – after only 24 hours into our adventure and that is true. Even the kids agree and that’s no mean feat. Hand on heart id totally recommend Lagoon Car Rentals, from the initial contact to the condition of the car I have zero complaints, you can book direct here. Note: Huge thanks to Lagoon Car Retals for their support on this trip. All words and opinions are my own and I retain full editorial control.